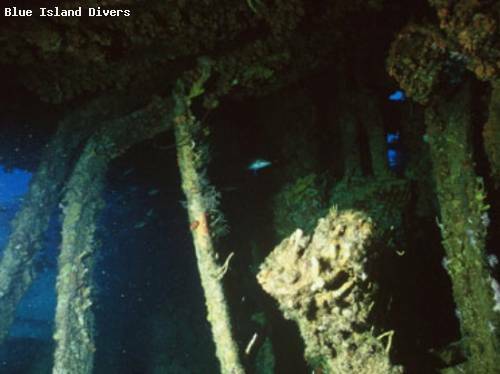 The SS Grainton is a huge shipwreck named after its namewise cargo and popular for cruising nurse sharks and pelagic. This is one of our deepest wreck sites and at times the most rewarding to dive. It is an advanced dive due to the depth and distance from shore, but wonders await the diver who has the training and the inclination to visit this grand old girl of the sea. We have been provided the history of the SS Grainton from the grand-daughter of Mr Chapman. The SS Grainton was built by Chapman and Willan who actually had four ships named S.S. Grainton and it was the first S.S. Grainton that sank off St. Thomas. It was built in 1911 in Stockton on Tees, Darlington, England and launched on 26th March 1911. It was 415x55x30.6 feet and weighed 6042 tons. At first it was used as a Royal Naval Collier and then chartered for wheat cargos from the USA, Canada and Australia. Its final journey was from Vancouver to Hamburg, with a cargo of grain worth 112.000 pounds. It struck Dry Rocks off Saba Island whilst on the voyage and was initially refloated and taken in tow, but it floundered shortly after just off St. Thomas on the 31st May 1928. The ships were named with the suffix 'TON' (Brighton, Grainton, Winton, Lynton, Scorton etc) was adopted as being a corruption of 'Tyne', the fleet's home river (i.e. Newcastle upon Tyne). Now the ship lies in 110 feet of water with her gunwales laid open to reveal her enormous 3 cylinder steam engine frozen in time. This engine stands fully 20 feet high and 10 feet across and is now home to schooling fish of all kinds. Large Nurse sharks are often seen on this deep wreck and many pelagic prowlers are encountered as they cruise by. The bottom time is limited because of the depth but never-the-less this underwater museum is definitely worth a visit. If you fancy taking your diving skills to the next level this is an ideal wreck on which to learn the PADI Tec Rec or BSAC Extended Range Divers skills of technical diving.